—Although its intensity ranges from brilliant sapphire opposite the sun, to the palest baby blue near the horizon, the color of the sky is true blue. 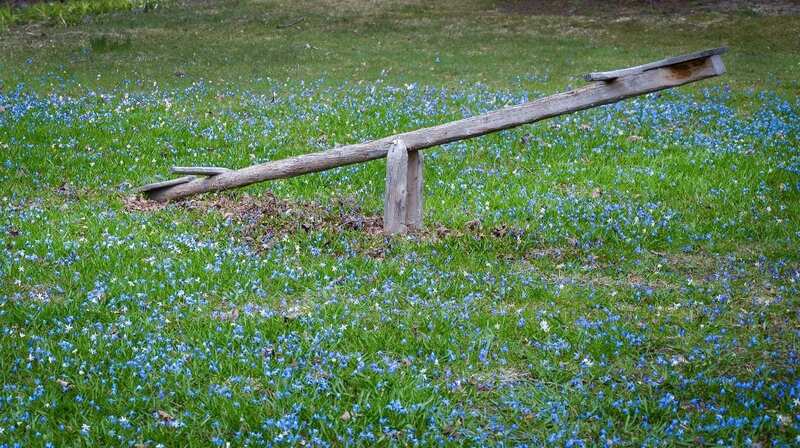 Blue flowers are also beloved by gardeners, and yet they seem really hard to find. There are plenty of flowers with overtones of red— pinkish-blue, mauve, purple and lavender—mostly blooming in summer and fall. But the spring blues, without a trace of pink, are the real thing. 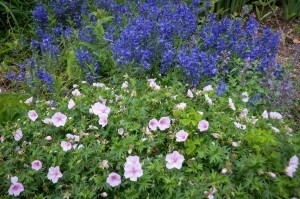 And they look especially lovely when combined with contrasting companions, such as yellow daffodils or pink geraniums. Here, in order of blooming, are my favorite spring blues and, to complete the picture, some contrasting plants that bloom at the same time. Spring starts out gently, around mid-April in the Champlain Valley and a bit later in the mountains, with the lovely blue Siberian squill (Scilla siberica). Squills are bulbs but they spread by seed to gradually form sizable colonies. Indeed volunteers even pop up among the stones of my patio. Plant a few dozen bulbs among some small jonquil daffodils and in a few years you will be rewarded by a mantle of blue and gold. 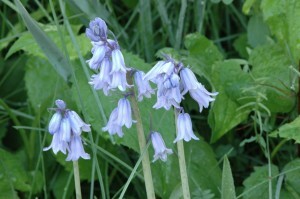 But, for a really stunning effect, grow squills in the lawn or even in a field and let them spread where they will. As long as you delay cutting the grass until early June the plants will have enough time to seed, as well as to store food in the bulb for next year’s flowers. More than once the sight of a huge patch of blue in an in-town lawn was enough to make me stop the car, gasp and reach for the camera. And last year, when driving out in Weybridge, I was completely bowled over by the amazing display in a field that spread some fifty feet beside the road. Forget-me-nots, Myosotis sylvatica, are true to their name, returning every year to create a splendid carpet beneath our serviceberry trees. Here they making a sumptuous statement among some yellow daisy-like flowers known as Leopardsbane (Doronicum orientaleas) and a large patch of pink creeping phlox (Phlox stolonifera ‘Pink Ridge’). 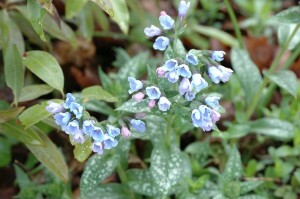 People tend to scoff at forget-me-nots as weedy. Certainly after flowering they quickly become tatty and mildewy. So enjoy the flowers while they last, then assertively cull the plants. This clears out the bed for the summer perennials, but always seems to leave a few plants to create next year’s display. 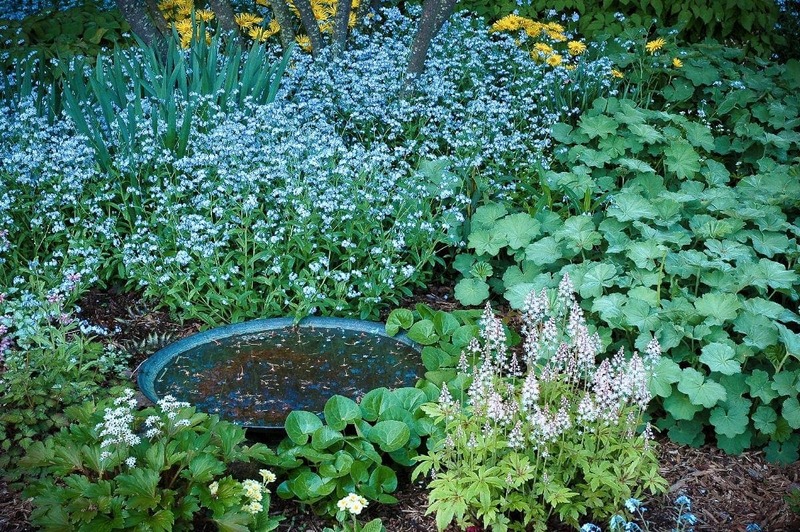 For me the pleasures of forget-me-nots were brought home many years ago now, when visiting a beautiful garden in Randolph in late May that was home to many varieties of mature lilac bushes, a legacy of the original owner and lilac expert. And I still remember all those beautiful flowering shrubs hovering over sheets of blue forget-me-nots! 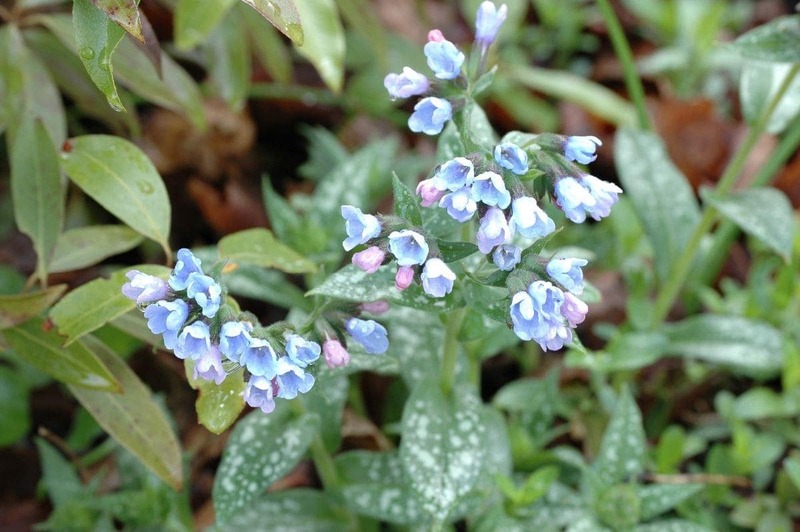 Lungwort, or Pulmonaria, gets its name from its spotted leaves, which apparently reminded people of a diseased lung. Let us not dwell on that, but rather enjoy the blue flowers which this shade-loving plant delivers every spring. 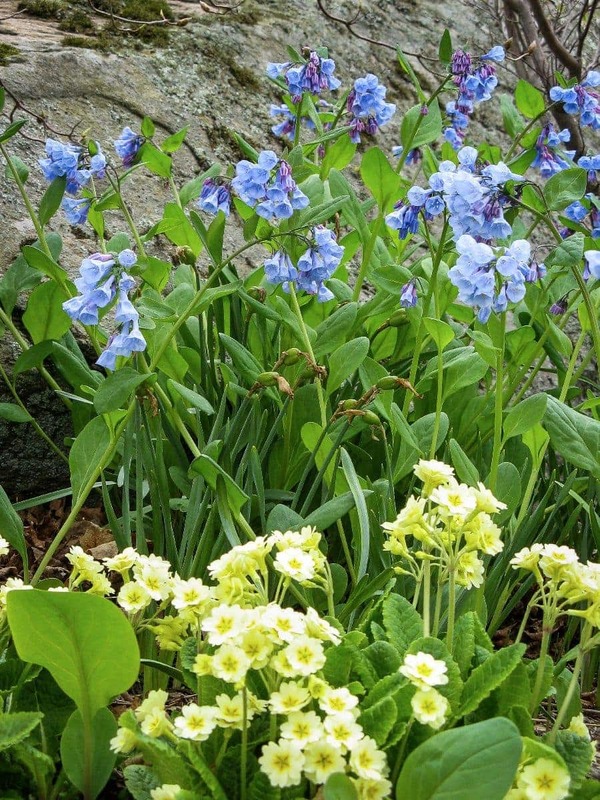 Next come the clear-blue bell-shaped flowers of our lovely native Virginia Bluebells (Mertensia virginica), which look lovely behind my English primroses (Primula vulgaris). 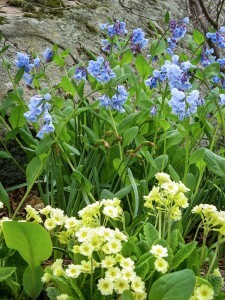 Virginia bluebells will self-seed modestly, with their progeny showing up several feet away from the parents. But you need to know that , once flowering time is over, everything completely disappears below ground. So, if you want to enlarge the density of your spread, take a few minutes in early June to move any strays back into the fold. Old world bluebells in my garden remind me of my childhood. 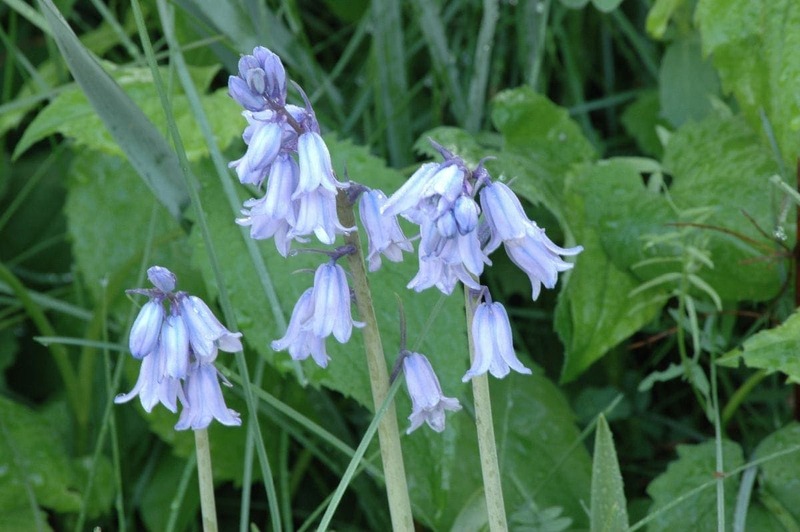 And while genetically unrelated to their Virginian namesake, English bluebells (Hyacinthoides non-scripta) almost match them in color. The wild bluebell woods of England are the stuff of legends, with a sea of blue seemingly stretching forever. So awhile back I planted a dozen bulbs in the rough grass at the edge of our garden. While they have yet to create that fabled ‘sea of blue’ they serve as a fond reminder of my English childhood. 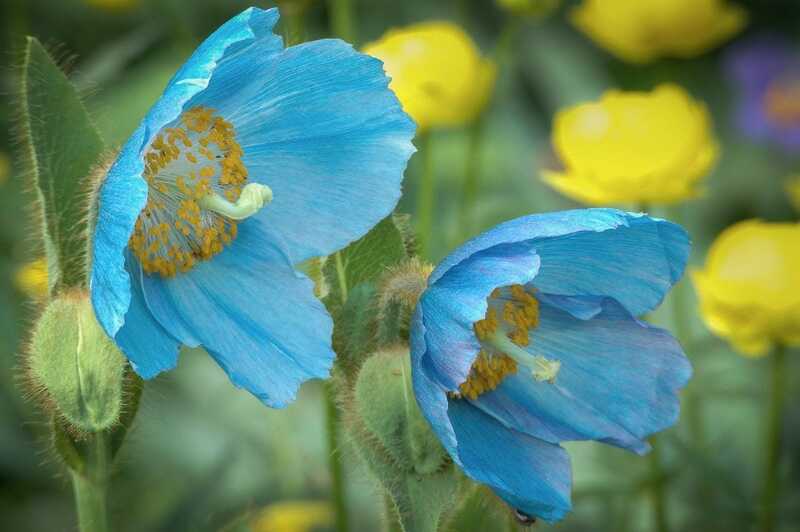 In 2005 I succumbed to the lure of the renowned Himalayan blue poppy, purchasing two plants of Meconopsis betonicifolia from Cady’s Falls Nursery in Morrisville. These poppies are famous for two reasons—they are really fussy to grow and they are an amazing shade of blue. Carefully following directions, I sited my two plants in rich soil where our serviceberry trees would shade them from the midday sun. This location has proven auspicious; every June I enjoy their arresting blue color surrounded by some cheery yellow Globeflower (Trollius europaeus). 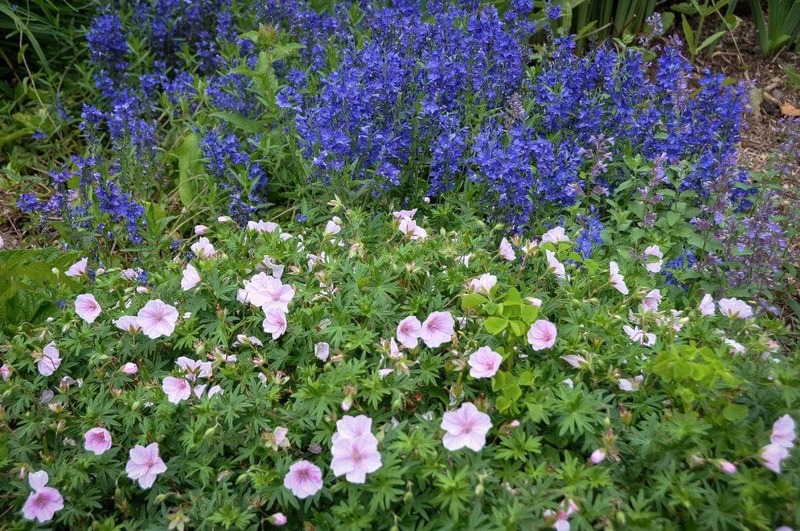 Grow Large Speedwells in well-drained soil near the front of a sunny border and, once they are done flowering, cut down the seedy stalks to tidy things up and mulch lightly. Finally surround the blank spot with some daylilies for summer color.